Local orthodontist, Dr. Derek M. Busciglio, wants to raise awareness of the dangers of texting while driving. He hopes that his newly launched online video trivia competition will help to reinforce those dangers. 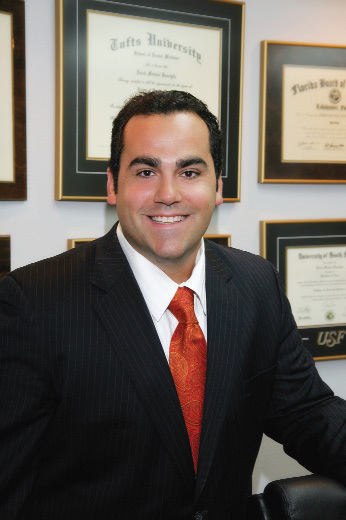 Dr. Derek M. Busciglio, an orthodontist with offices in Brandon and Plant City, has recently announced the launch of a social media and community awareness campaign to address the issue of texting and driving among local area drivers. He hopes the message hits home with not only his patients, but everyone on the road. With teenagers making up a good majority of his patients, Busciglio regularly hears of the dangers they face on the roadway with distracted driving becoming a recurring trend. So, he is taking matters into his own hands, educating teens and adults on the dangers texting and driving pose. Busciglio recently launched a unique online video trivia competition to reinforce the dangers of texting and driving. Utilizing Rivvid, a new online video trivia Website, he has created a video trivia game designed to educate users on the dangers of distracted driving. On Busciglio’s Rivvid Channel (www.donttextanddrivegame.com), users must answer trivia questions pertaining to 15-second video clips about texting and driving, all the while responding to simulated onscreen text messages sent to them. Using their mouse and keyboard, players must respond to text messages displayed via an onscreen phone while having to answer video trivia questions correctly; receiving points for how many questions they answer. The game is designed to test users’ attention by creating a distracting environment similar to when people text and drive. Busciglio is giving away AMC movie tickets to the top scoring participants on his video trivia game. On his website (http://theorthodoc.com) and Facebook Page (www.facebook.com/TheOrthoDoc), Busciglio is providing weekly tips on how to avoid the dangers of distracted driving. He’s also giving away thumb bands in an effort to remind people not to text while behind the wheel. Busciglio is inviting other local businesses to get involved with the campaign through three sponsorship packages he’s offering on his Rivvid Channel (www.donttextanddrivegame.com). For $75, organizations can sponsor the campaign and have their logo displayed on the game’s sponsor’s page (donttextanddrivegame.com/sponsors). For $95, they’ll get their logo displayed on the game’s sponsor’s page and receive printed brochures to distribute locally. For $345, they’ll get their logo displayed on the game’s sponsor’s page, receive printed brochures and have a press release written and distributed to their local media, about their support for the campaign. For more information or to participate in Busciglio’s texting and driving campaign, visit his video trivia game at www.donttextanddrivegame.com. For additional information on traffic laws or proposed bills, contact traffic attorney Dina Sheridan at Dina@FightTheChargeTampa.com.